Edmonton's Theatre Network Society is getting just over $300,000 in federal funding to go towards the rebuilding the Roxy Theatre on 124th Street. As they say in the theatre, the show must go on. For Edmonton's Roxy Theatre, that means returning to its roots on 124th Street, three years after a devastating fire. On Friday, MP Randy Boissonnault announced $330,000 in federal funding to help with the architectural design of rebuilding the popular venue. The investment from the Canada Cultural Spaces Fund will support the architectural design of a new facility to be built at its original Westmount location. "The Government of Canada believes fundamentally in arts and culture and the importance that it plays in our lives. Art reminds us that we are human," Boissonault said. "In the case of the Roxy Theatre, it is very important for us to be involved in the architecture and design of bringing this jewel in Edmonton's crown back to 124th Street." The City of Edmonton is also contributing more than $200,000 to the project from its Community Facility Partner Capital Grant Program. "This investment by two levels of government; it's vital; it's critical", said Bradley Moss, artistic and executive director of the Theatre Network Society, which owns and operates the Roxy. "There's been a lot of hoping, wishing, and working, but today's announcement feels like it's that first step of 'Yes this is going to happen' and that's what's exciting." The Roxy first opened on 124th Street in 1938 as a movie theatre. It was converted into a 200-seat live-performance facility in 1989 and quickly became an integral part of the city's performing arts scene. 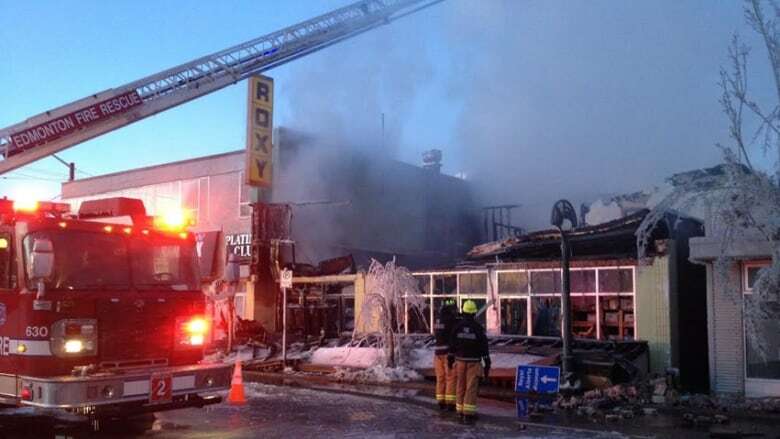 Fast forward to a frigid January morning in 2015, when flames and heavy smoke reduced the Roxy to rubble. It was a devastating loss for both the local theatre community and businesses on 124th Street. Representatives from the federal and municipal governments gather Friday to announce funding to rebuild the Roxy Theatre. "If you look at the whole life of the area on 124th, especially now, the restaurants and everything is there. You can see that we were part of a catalyst to grow those industries. Not alone, but we were contributors to it," Moss said. "We're that piece that really fills everything and makes the place come alive and gives you a reason to go there not just for dinner." The city currently has plans in the works to improve the 124th Street corridor. In a statement, Mayor Don Iveson said returning the Roxy to its original location will help enhance those efforts. "The new Roxy Theatre will be a welcome addition to our city's downtown, helping to make the 124th Street area an even more attractive destination," he said. In addition to bolstering the local arts scene, Boissonnault said it's important for his government to invest in arts and culture for economic reasons. "So 3.5 per cent of our national GDP employs people in the arts and culture space. It's 630,000 jobs across the country and so when we have a tragedy like the fire that took the Roxy from us in 2015, it's important for the federal government to come to the table." The new theatre will be a purpose-built venue designed specifically for Theatre Network's needs with space for other artistic endeavours, Moss said. "We think the venue will be around the same size, 200 seats, but we'd like to see another venue in there, some rehearsal facilities, those kinds of things where that allows us to be a real community player. Not just generating product but helping our community build art," he said. Before the curtain goes up on a new facility, a lot of fundraising still needs to be done. The new building is tentatively slated to open by 2020. Alicia Asquith is an award winning journalist based in Edmonton. She is also the host and producer of the CBC Alberta television news on weekends. She's previously worked as a reporter and video journalist in British Columbia, Saskatchewan and Venezuela.